FreeRewards4ublog: On the TO DO list today...Focus! 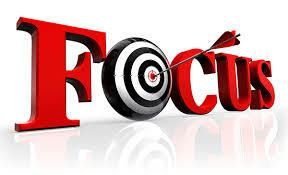 On the TO DO list today...Focus! This is to all the TE owners out there who look back on the day and ask "Where has my day gone?" I went out side to water the garden. As I turn on the hose I look over at my car and decide that it needs a wash. I decided to wash my car. As I start toward the garage, I notice that there is mail on the hall table. I decide to go through the mail before I wash the car. I lay my car keys down on the table, put the junk mail in the trashcan under the table, and notice that the trashcan is full. So, I decide to put the bills back on the table and take out the trash first. But then I think, since I'm going to be near the mailbox when I take out the trash anyway, I may as well pay the bills first. I take my checkbook off the table, and see that there is only one check left. My extra checks are in my desk in the study, so I go to my desk where I find the bottle of coke that I had been drinking. As I head toward the kitchen with the coke, a vase of flowers on the counter catches my eye--they need to be watered. I set the coke down on the counter, and I discover my reading glasses that I've been searching for all morning. I decide I better put them back on my desk, but first I'm going to water the flowers. I set the glasses back down on the counter, fill a container with water and suddenly I spot the TV remote. Someone left it on the kitchen table. I realize that tonight when we go to watch TV, we will be looking for the remote, but nobody will remember that it's on the kitchen table, so I decide to put it back in the den where it belongs, but first I'll water the flowers. At the end of the day: the car isn't washed, the bills aren't paid, there is a warm bottle of coke sitting on the counter, the flowers aren't watered, there is still only one check in my checkbook, I can't find the remote, I can't find my glasses, and I don't remember what I did with the car keys. Then when I try to figure out why nothing got done today, I'm really baffled because I know I was busy all day long, and I'm really tired. I realize this is a serious problem, and I'll try to get some help for it, but first I'll check my e-mail. I don't know about you but I'm not that old and still get distracted easily. This can easily happen to us online also. Count how many tabs you have open right now! I have proven my point. Sometimes it is soooo hard to focus on one thing to completion that I recommend some sort of note taking and check list. Our attention goes to so many things and areas not just online but offline too. The issue is not just to FOCUS but to PRIORITIZE your day. For me I make sure my promos are all set for my traffic exchanges, Rewards4surfing and MoneymakersXchange....the day before. That the emails are all written. That it is in the Promo calendar. Then everything should fall in line around this. Then there is Facebook and Skype. Great for communication but also great for distractions. I have an A4 note book that I use for my notes and each page is one day. It has the sites I want to surf also for that day too. I would love to hear from you all how you spend your days online and how you organize yourself. Let's get ORGANIZED so we all don't end up like we are having a wasted day like the above scenario!